This week, I read Not Now, Bernard (David McKee) and Angry Arthur (Hiawyn Oram & Satoshi Kitamura) to my second graders. 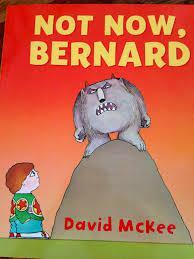 After a vote, it seems Not Now, Bernard’s cover appealed to them more. However, the reactions soon turned cold as they witnessed the mother’s tired tone and closed eyes. Indeed, after the monster had sat alone in front of the television, read comics the wrong way, and was sitting in Bernard’s bed, all the children were echoing his final statement, ‘But, I’m a monster.’ They seemed shocked that the parents hadn’t noticed that their child had been replaced with a monster. When I asked if these were good parents, they said no. Why? Because they don’t sit with him (their son). I also asked why Bernard went to meet the monster in the garden, though he knew that it would eat him (as he had told his mother on the page before). While this question boggled most of the students, one girl immediately answered, because no one else wanted to sit with him. After reading, one boy became so immediately attached to the story that later on he indeed asked me to reread it and I even allowed him to take it home to his parents to ask them to buy him a copy. There’s a book for every child after all. Next, I read Angry Arthur, the story of a little boy whose anger explodes when his mother tells him to turn off the TV and go to bed with the repeated ‘That’s enough.’ Arthur’s anger becomes the plot, growing magnificently with every double spread until Arthur is in space with only his bed and cat, not quite remembering what made him so angry. Though the second graders did not know all the words, such as “typhoon” “tremor” and Oram’s own “universequake”, the illustrations said a great deal. They are extremely detailed and expressive, similar to Maurice Sendak, and a pleasure for a child’s keen eye. The children loved picking out where the cat was on each page, how different objects had been destroyed, and other details. One particular illustration they loved was the Earth cracked like an egg. Upon finishing the story, I asked a few questions. First of all, all of the children knew and apparently understood why Arthur had gotten angry – though one mentioned half way through the story “All this for TV?” – a rather haste conclusion to reach. I asked, why is the cat always with him? Because she loves him, a child said straight out. Another said, it wants to go home. And another, it’s afraid it will fall off the bed. While the last comment demonstrates the character’s selfishness or self interest, the first represents the cat’s understanding of Arthur’s anger, unlike his human family. I replied, ‘But don’t his mother, father, grandfather, and grandmother love him too?’ to which the answer was silence and intent starting at the book in my hands. Both books share the repetition of a phrase by adults, ‘not now’ and ‘that’s enough.’ These small phrases, said almost off-handedly by adults, seem to communicate disinterest, negligence, a lack of love, and lack of understanding to children – if my second graders have anything to say about it. Both child protagonists, sad/angry little boys/monsters face a lonely and softly unhappy end. When voting for which book they like more, most voted for Angry Arthur, except of course the little boy who loved Not Now, Bernard. Upon finishing the lesson, one girl mentioned to me on the way out how both books were actually quite similar. Insight, to say the least.